At the Apple October 2014 special event today, Apple has unveiled the iPad Air 2, and it will come with the faster A8X chip designed specifically for the iPad Air 2. This is 2nd-generation 64-bit architecture with 3 billion transistors. 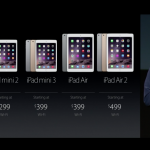 It will be 40% faster than the original iPad Air, and has a 2.5x faster GPU.